Food should be fun. And few things are as fun as food fusion – mixing two different food styles to create something new and different. 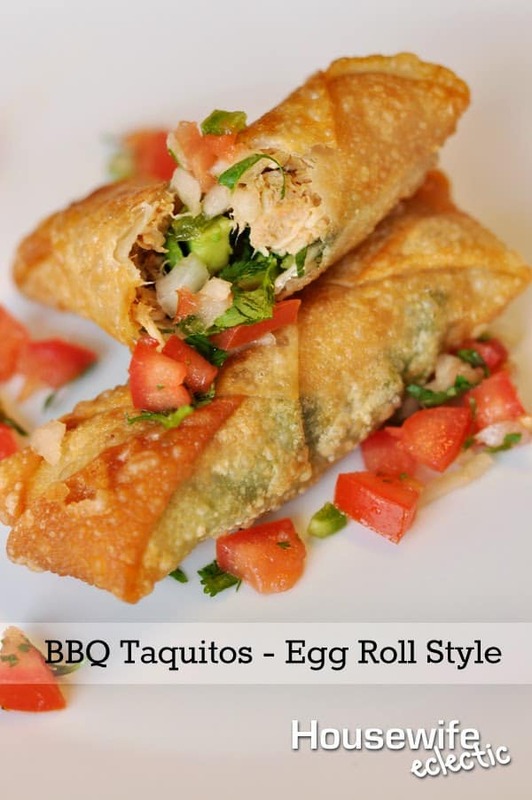 I’ve highlighted my BBQ Taquitos recipe before – a family favorite – but my husband can’t ever leave recipes alone and had this idea to make these taquitos in an egg roll wrapper rather than a tortilla. And let’s face it, everything tastes great in an egg roll wrapper. This recipe is Mexico meets Asia. And it’s amazing! Boil chicken breasts in pot of boiling water until chicken is cooked. Saute jalapeno in a small pan until jalapeno is softened and starts to lightly brown. Be careful not to add too much oil when sauteing. Fry in vegetable oil until egg roll wrapper turns brown and crispy (watch carefully because it’s easy to burn). Dip in sour cream, hot sauce or salsa. Fresh pico de gallo also makes a great side. So what makes this dish so awesome? First, the egg roll wrappers add a light crispiness to the dish. Sometimes fried tortillas can feel so heavy. Plus, the jalapeno, cilantro and avocado really bring out the flavor. Seriously, I might just be addicted to these. Wow, those sound incredibly delicious. I love snacks like this! You are absolutely right, everything does taste better in an egg roll wrapper! Those look phenomenal!! I will have to give them a try. OMG thos look so good! I love baking inside egg roll wrappers because they make good food for "on the go" or just a quick snack. These are a new twist for egg rolls. It's good to mix flavors and styles to come up with new recipes. I like this, it seems lighter than a tortilla.. and it is something different to try..
Those look great, love Mexican food! oh my gosh these look Ah-mazing. I'm coming over for dinner k? These look delicious! I am trying to eat healthier and these look like they could fit in my meal plan! With your version, I may just try my very first egg roll! Yummy! I love this version with the egg roll wrappers! I really like egg rolls and I have gotten on a kick of trying just about everything I can think of in an egg roll wrapper. This one will be my next one I try. Thank you for sharing. My husband can't leave recipes alone either, but I can't say that I hate it. Very rarely does it turn out badly. These look delicious! I can't wait to try them. Thanks for sharing.